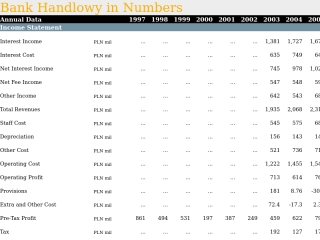 This Annual Statistical Dossier offers a comparison of 18 Polish banks from 1997 to 2017 on an annual basis. The report can be downloaded as an Excel file. Alternatively, you can find similar data for the Czech banking sector in the banking Sector Profile. If you are interested in the banking quarterly figures, please refer to the banking Quarterly Statistical Dossier. Download a sample excel file attached to see more details. On purchase, the hidden cells will be unlocked and all available data wll be visible. This Annual statistical dossier offers a summary of Pekao SA's performance between 1999 and 2017 on an annual basis. The report can be downloaded as an excel file. You will find here the key numbers from the bank's balance sheet and income statement and the main ratios related to the bank's business such as asset quality, capital ratios, number and cost of employees or a detailed breakdown of some of the bank's business such as its loan portfolio. In addition, the excel file provides a detailed overview of the bank's market position in comparison with the overall banking sector. You can, for example, track Pekao's market position in mortgage or consumer lending. If you are only interested in particular areas of the bank's business, you can find and download specific indicators from the bank's corporate profile, or specific charts from the bank's charts section, where you can find a comparison of the bank with its peers. 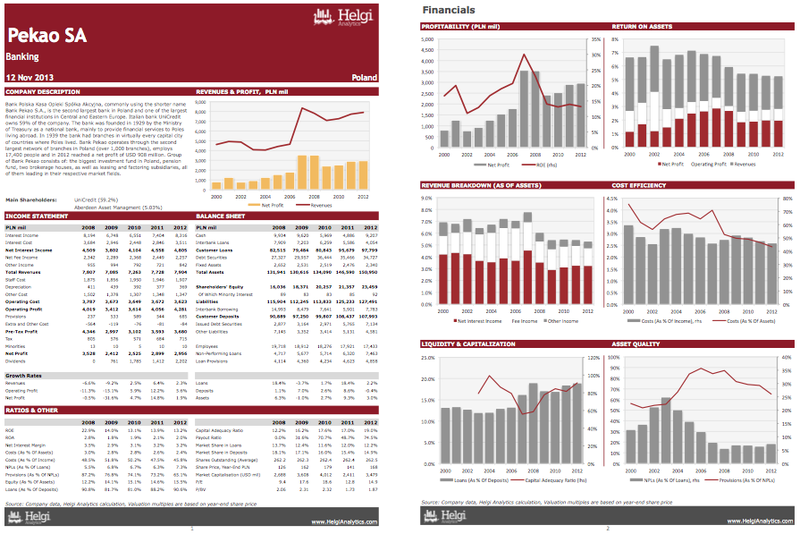 If you are interested in the bank’s quarterly figures, please refer to the bank’s quarterly statistical dossier. Bank Polska Kasa Opieki Spółka Akcyjna, commonly using the shorter name Bank Pekao S.A., is the second largest bank in Poland and one of the largest financial institutions in Central and Eastern Europe. Italian bank UniCredit owns 59% of the company. The bank was founded in 1929 by the Ministry of Treasury as a national bank, mainly to provide financial services to Poles living abroad. In 1939 the bank had branches in virtually every capital city of countries where Poles lived. Bank Pekao operates through the second largest network of branches in Poland (over 1,000 branches), employs 17,400 people and in 2012 reached a net profit of USD 908 million. Group of Bank Pekao consists of: the biggest investment fund in Poland, pension fund, two brokerage houses, as well as leasing and factoring subsidiaries, all of them leading in their respective market fields. 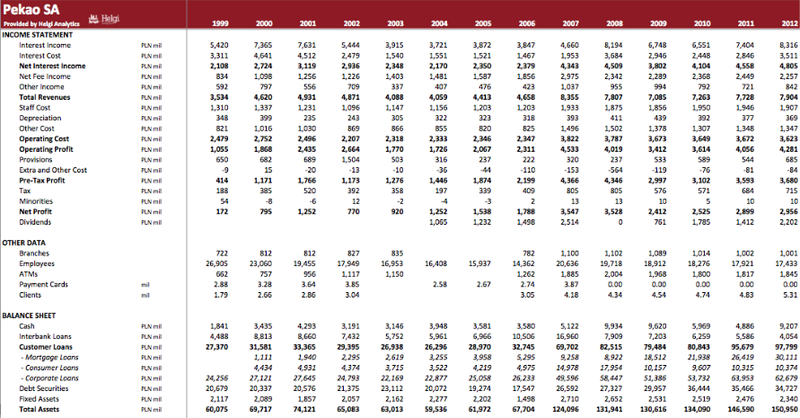 This report offers a summary of the company's performance in 1999-2012. You will find here all the key numbers from the bank's balance sheet, income statement and main ratios related to the bank's business. In addition, the report provides a detailed overview of the bank's market position in the comparison with the overall banking sector. 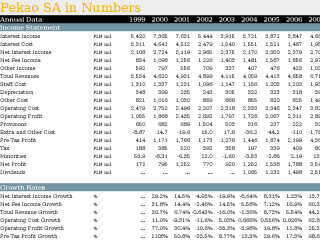 This excel file offers a summary of the company's performance on the annual basis in between 1999-2012. You will find here all the key numbers from the bank's balance sheet, income statement and main ratios related to the bank's business. Pekao SA's mortgage loans reached PLN 50,446 mil in 2017, up 9.60% compared to the previous year. Polish banking sector provided mortgage loans of PLN 391 bil in 2017, down 1.49% when compared to the last year. Pekao SA accounted for 12.8% of all mortgage loans issued in Poland at the end of 2017. Historically, the bank’s market share in mortgage loans reached an all time high of 13.7% in 2001 and an all time low of 4.61% in 2008. You can see all the company’s data at Pekao SA Profile, or you can download a report on the firm in the report section. Pekao SA's consumer loans reached PLN 13,711 mil in 2017, up 13.5% compared to the previous year. Polish banking sector provided consumer loans of PLN 278 bil in 2017, up 6.64% when compared to the last year. Pekao SA accounted for 9.55% of all consumer loans issued in Poland at the end of 2017. Historically, the bank’s market share in consumer loans reached an all time high of 9.55% in 2017 and an all time low of 2.84% in 2000. That's compared to a 10.4% market share the bank held in terms of total assets at the end of 2017. Pekao SA's corporate loans reached PLN 73,314 mil in 2017, up 4.44% compared to the previous year. Polish banking sector provided corporate loans of PLN 366 bil in 2017, up 6.11% when compared to the last year. Pekao SA accounted for 20.0% of all corporate loans issued in Poland at the end of 2017. Historically, the bank’s market share in corporate loans reached an all time high of 28.6% in 2007 and an all time low of 17.8% in 2003. Pekao SA's customer loans reached PLN 127,949 mil in 2017, up 7.80% compared to the previous year. Polish banking sector provided customer loans of PLN 1,206 bil in 2017, up 3.69% when compared to the last year. Pekao SA accounted for 10.6% of all customer loans issued in Poland at the end of 2017. Historically, the bank’s market share in customer loans reached an all time high of 16.9% in 1999 and an all time low of 10.1% in 2006.